What difference could natural flood management techniques make? On Wednesday 6 January four scientists from the Centre for Ecology & Hydrology gave an hour-long background press briefing on the science behind flooding. Yesterday we posted a summary of the introductory hydrological points made by Professor Alan Jenkins, our Deputy Director and Director, Water and Pollution Science. 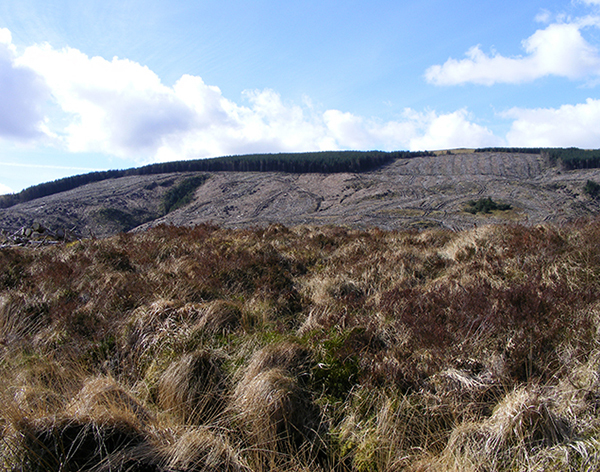 Today’s post, by Prof Jenkins and colleagues Nick Reynard and Jamie Hannaford, is based on the parts of the briefing that examined natural flood management techniques such as tree planting, creation of woody debris dams and changes to upland management practices. In most cases the text below is based on the wording used by the scientists on the day. Questions from the audience were wide-ranging, so they’ve grouped the answers they gave on the day under a number of common areas. Examining the scientific evidence – what do we know about natural flood management? The use of ‘natural’ techniques for managing floods is much in the news at present. Here at the Centre for Ecology & Hydrology we have a long history of research on catchment science covering upland and lowland areas across the UK (and further afield). CEH scientists have been involved with work at research catchments including Pontbren, Plynlimon, Balquhidder, and many more, as well as national scale hydrological monitoring and modelling over the last five decades. On Wednesday the three of us attended a press briefing in London where we were asked a number of questions on natural flood management techniques. We’ve summarised our responses below. It’s important to note that our answers are based on our varied experiences as hydrologists working on a variety of projects. We haven’t provided references here and would be very happy to expand on the points, and engage further. Our contact details can be found in the links at the bottom of the post. There are many things that we believe can be done to mitigate floods, to stop floods happening or to reduce flood impact. Some of these things are perhaps manmade but some are more natural, such as rewilding of the environment which has been suggested many times over the last few weeks. All of them will work to some extent in some location. But hydrologically it's unlikely that any one of them will work to the same extent everywhere, or will provide a panacea for protecting all communities, all sites, against flooding. …there is very little published scientific evidence that changes in the way we manage the uplands would have helped to reduce the flood impact in those flooded areas over the last few weeks. …although there's very little documented scientific evidence that different upland management would have helped, we were not saying that planting trees, or blocking drains, or removing sheep, would not have prevented flooding. We simply don't have the evidence to say that removing the sheep, covering the uplands with trees and building beaver dams, or having beavers build dams, would or would not have prevented the recent extreme flooding. Based on the published scientific evidence we don't yet know the answer. We replied that it's to do with scale and magnitude. A crucial point is the scale at which these kinds of scheme can operate and provide some kind of mitigation against flood peaks, and they will work in local and small catchments. They can provide some reduction in the flood peak or a slowing down of some of the water in local areas. We added that it is also about the magnitude of the event, so they will work probably for events that are less extreme. However the more extreme events will overcome all of those sorts of schemes, and they'll cease to be effective on a large catchment scale for these very big events. What we have seen so far this winter is remarkable; the wettest calendar month on record and some extraordinary daily totals, including the new 24h record. Extreme rainfall was observed over very large areas of upland Britain. Fuller analysis will be released on Friday 15th January within the December 2015 Monthly Hydrological Summary for the UK. 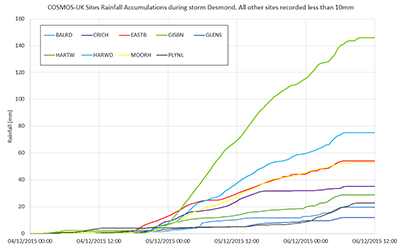 Graph right shows rainfall accumulation at COSMOS-UK sites during storm Desmond. So it's not to say they don't work, there is some evidence from some of these schemes that have been put in with monitoring associated with them, which shows some attenuation for flood peaks, at local scales. The danger is then extrapolating that from a local scale benefit, to a national or even a large catchment scale, that it will reduce large flood peaks. To conclude; there is some evidence from some smaller scale studies. The problem is that there’s quite a limited amount of research that's been done, and a lot of the work that has been done has all come to a similar conclusion that there would be some effect on some smaller flood peaks, but as soon as you get more extreme events then those local scale measures aren’t going to make much difference. Flood management is about a basket of measures. Some of them about engineering, such as the flood defences we have in towns, and so on. But they work as absolute defences, and upland management schemes will contribute to those. So we think if you have a basket of measures you'll protect against some events, and you’ll protect against others using high-class engineering. So we're not saying one thing will solve it. We're not about flood defence, we're about flood management, so it's a whole range of things that will contribute to managing it. We also talked about the work on infiltration rates at Pontbren, Wales, which was carried out by CEH scientists. On the afforestation issue specifically, there's been a lot of selective use of results from the Pontbren experiments which CEH were involved in, there's a lot of quoting the figure around, “infiltration in forested areas being 60 times more than in grassland”. You have to be very careful in interpreting those things. The result is important, but going back to what we said earlier about very extreme events, the additional infiltration is very useful but just because water goes into the soil doesn't meant that that's problem solved. Think about the uplands, you've got very thin soils and the rocks underlying them are impermeable, i.e do not absorb water. So water doesn't just flow on the top of the soils, in fact often it doesn't, you've got flow in the soil itself, so just having more infiltration is not necessarily beneficial. Put simply you can't just extrapolate from these small plot experiments showing you have more infiltration to saying that forests will instantly be the solution. Even with greater storage, with big enough events stores will fill up. A good analogy is a sponge, people again have made analogies of the uplands needing to be like a sponge. However even a sponge has a capacity and once stores start to become full up then of course they start to contribute to flow further downstream. Debris dams can be part of this raft of measures that we’ve talked about and they can be very small, log dams that just hold back some of the water and some of the sediments. They're good for all sorts of reasons, such as water resources, for water quality, for carbon storage, so there's lots of good reasons to do that and they also contribute to flood mitigation at a local scale. So it's the same sort of issue though, you can have these dams and they might work but remember, for example, flood retention areas only work if they're empty or half empty, once they're full then there's no more capacity for them to hold back any more water so they only work to a certain level as well. There are different ways of doing experiments…We could go out and undertake field experiments. They're difficult, we’ve talked about the difficulty of the extrapolation from the small scale. We can only do small scale, plot scale we would call them, a few tens of meters on a short time scale, for a whole catchment we have to monitor for a long time period. So you would have to make an intervention, either take the sheep away, or put the trees in, and then you've got to wait for some time, in fact you've got to do some pre-manipulation monitoring and hope that you get some storms, and then you've got to do some post-manipulation monitoring. So what we’re saying is it takes a lot of years. We do have the opportunity to look around at catchments that are similar from the historical record which we could go away and start to do because we've got a lot of data from a lot of catchments. We also have a number of models, hydrological models that we can perturb, and have a look at the outputs, but some would argue that that's not really evidence, but rather give you an indication of what's likely to happen. So we can start that immediately. But the hard evidence is really in observing a changed response, and that's not easy in a short time span. So in terms of experiments, the EA, SEPA, Natural Resources Wales and the Forestry Commission, and others, they are all putting in quite a lot of these types of schemes, and they're putting them in with monitoring. So they've just started over the last few years, and this is happening across Europe as well, actually, so there will be data coming in about how the response might have changed, hopefully at places where we have historical records where we can compare against. So there are going to be data coming in on the effectiveness or not of these schemes. That still leaves the problem of scaling up. How do we then build up to a national picture, how will that contribute to flood mitigation? Much more science is needed here. Natural flood management is one of those things that is 'no regrets', to use climate parlance. So we think that, although the evidence is limited, that on a big catchment scale, those measures will mitigate flooding, it is very likely that they will have some beneficial effect and that they will also have a lot of other positive environmental benefits. So it makes good sense to look into those policies where one can.